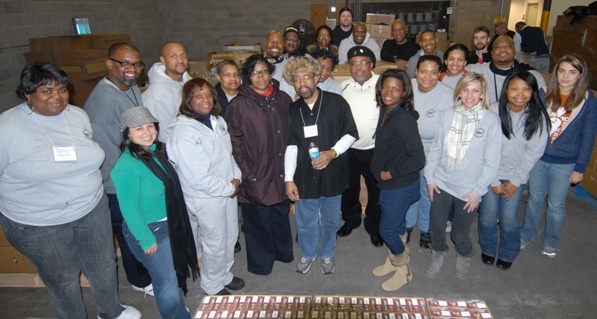 IAM members packaged more than 6,000 meals for needy residents during the community service portion of the AFL-CIO Dr. Martin Luther King, Jr. Holiday Observance in Cincinnati, OH. IAM members joined with hundreds of union activists from across the country for a full schedule of activities at this year’s AFL-CIO Dr. Martin Luther King, Jr., Holiday Observance in Cincinnati, OH. In addition to workshops and panel discussions, delegates heard from a list of distinguished speakers that included AFL-CIO Executive Vice President Arlene Holt Baker, Ohio Democratic Sen. Sherrod Brown and Jacqueline A Berrien, Chairwoman of the U.S. Equal Employment Opportunity Commission. As in past years, the 2011 observance featured a full day of community service activities with union volunteers fanning out across metropolitan Cincinnati to paint and repair inner city schools in addition to providing tutoring for needy students. The IAM delegation traveled to a local food bank, where they packed more than 6,000 meals for distribution to local residents. The Cincinnati observance also included the traditional parade and a candlelight vigil to oppose Ohio Republican Gov. John Kasich’s proposal to eliminate collective bargaining rights for Ohio’s home health care and child care providers. Kasich is among a number of newly-elected conservative governors who are using fiscal austerity as an excuse to attack public employee unions, pensions and bargaining rights.